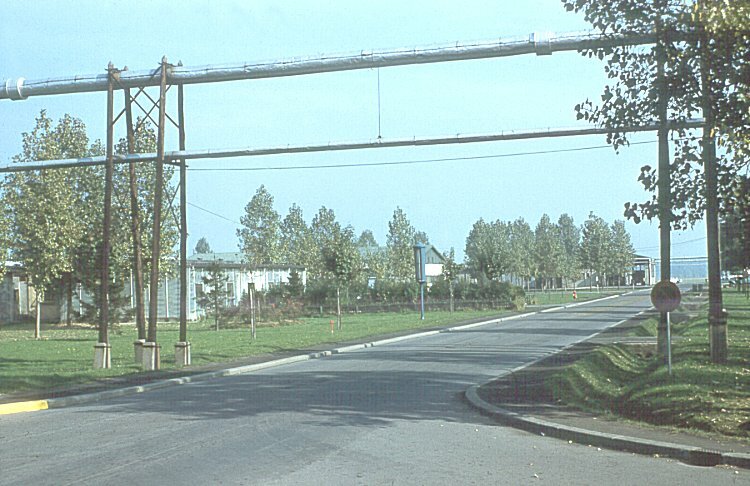 421 Squadron barracks - October 1984. The foundations are all that remained. 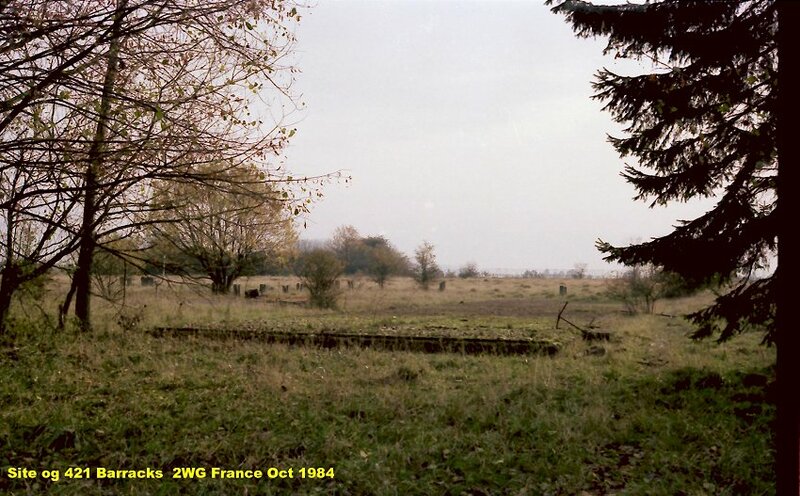 423 Squadron barracks - October 1984. 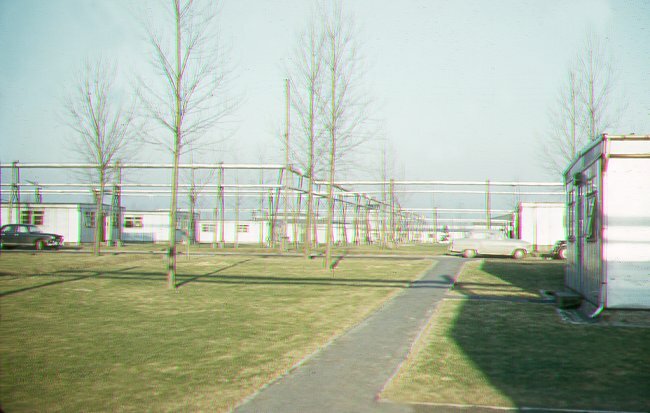 430 Squadron barracks - October 1984. 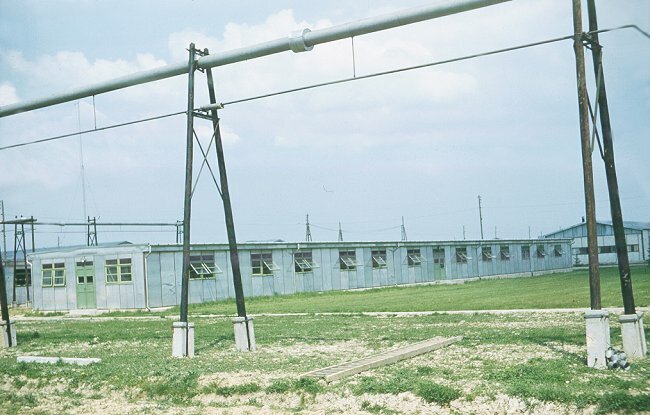 Barracks on the station - March 1964. 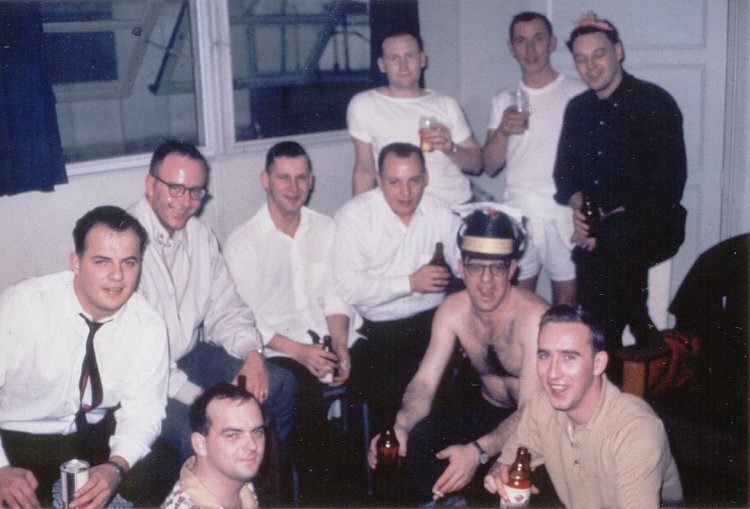 Another gathering in Pete Uschko's room in barracks - December 1963. 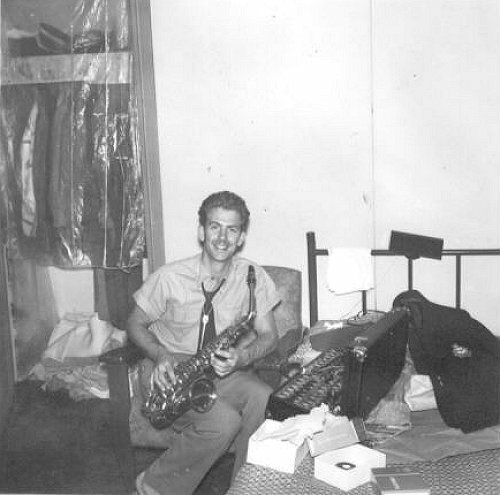 Left front Len "Suds" Sutherland . 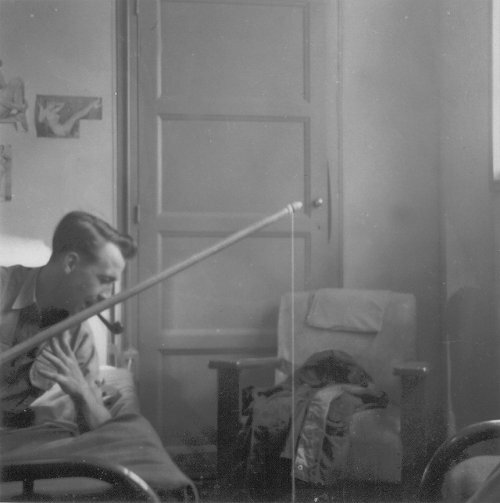 John Cline and Peter Uschko standing in rear. 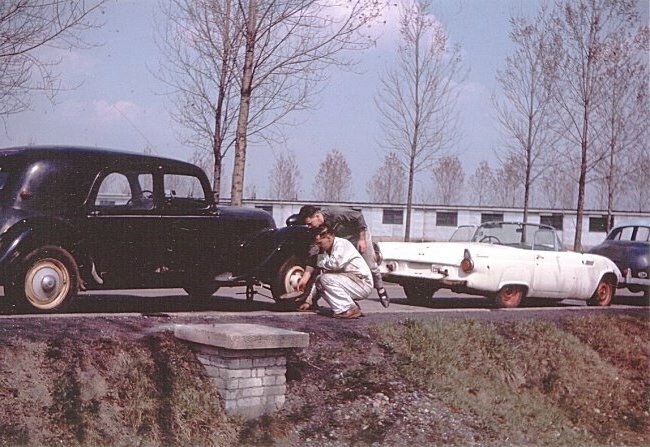 John Roberge (white coveralls) and Grant West repairing a tire on Grant's vehicle outside of the barracks at 2 Wing - October 1963. 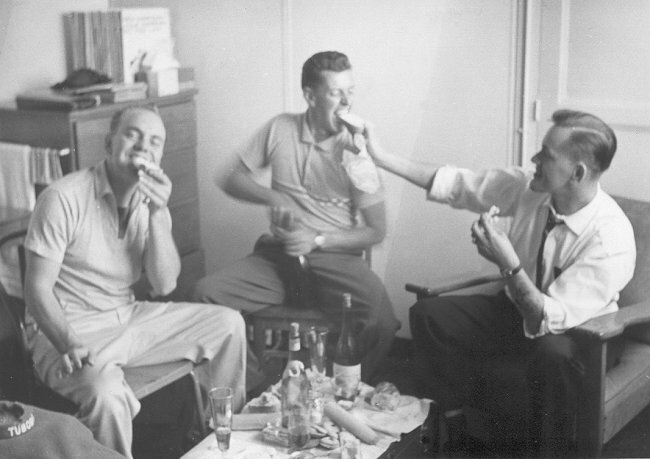 A party in Pete Uschko's room in barracks - October 1963. 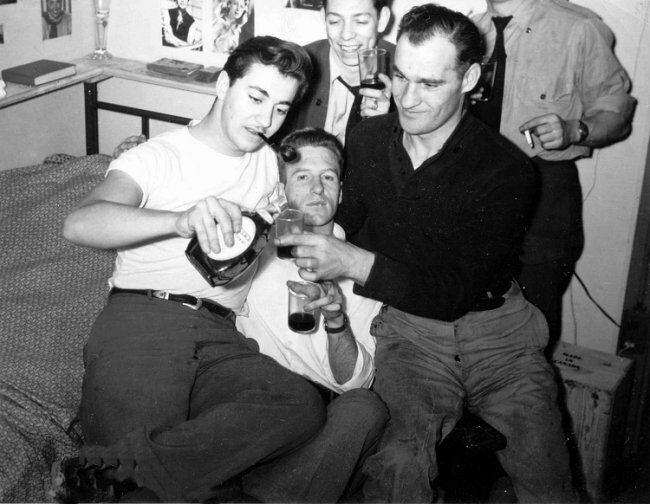 (L-R) Unknown, Pete Uschko, Len Sutherland (with jug), unknown, unknown. 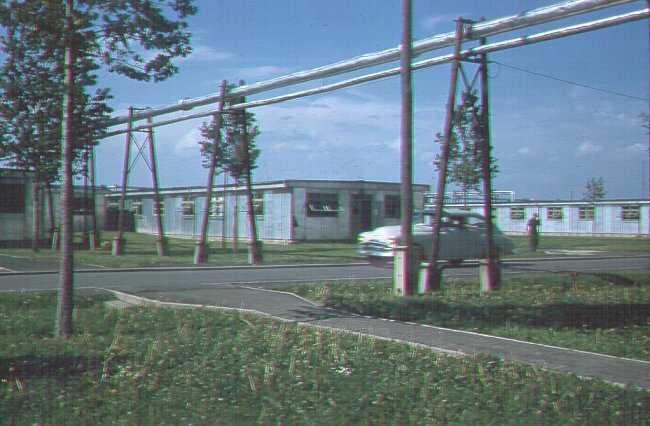 Barrack blocks on the airfield - October 1961. 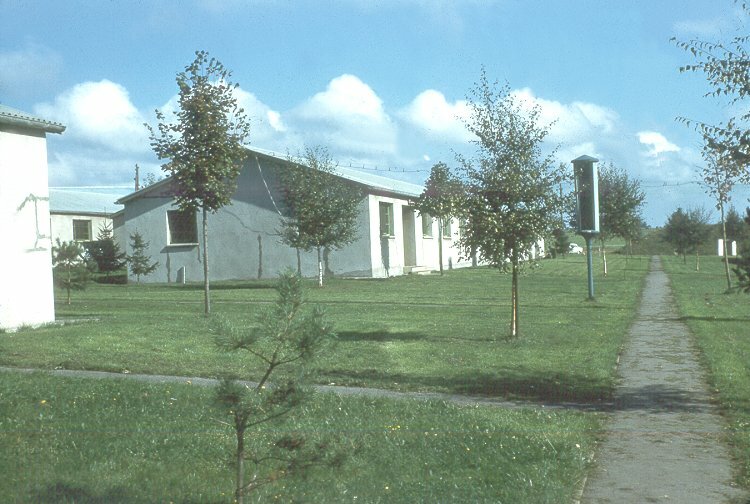 Barracks on the station - September 1961. Wine & Chesse night in the barracks. (L-R) LAC Michel "Mike" Fleury (Safety Equipment), LAC Raymond "Butch" Bouchard (430 Squadron), LAC Lucien "Lou" St-Hilaire (AFP) - August 1961. 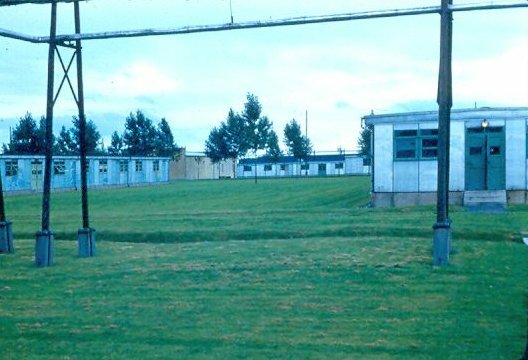 Barracks on the station - May 1961. 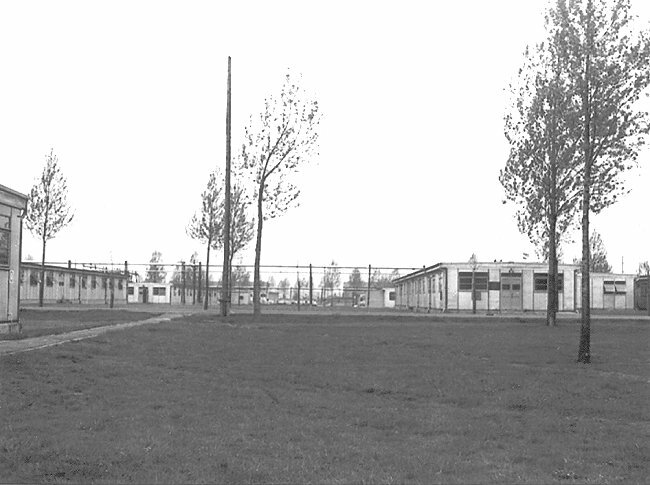 LAC Duff Shaw in barracks - April 1961. 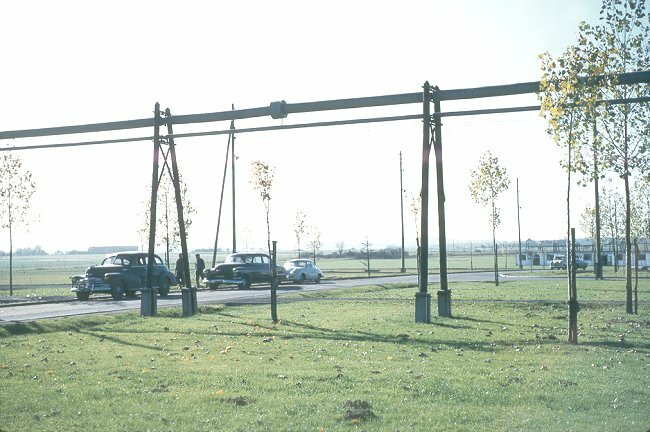 Cars parked by the barracks getting ready to depart for the Riviera - April 1961. 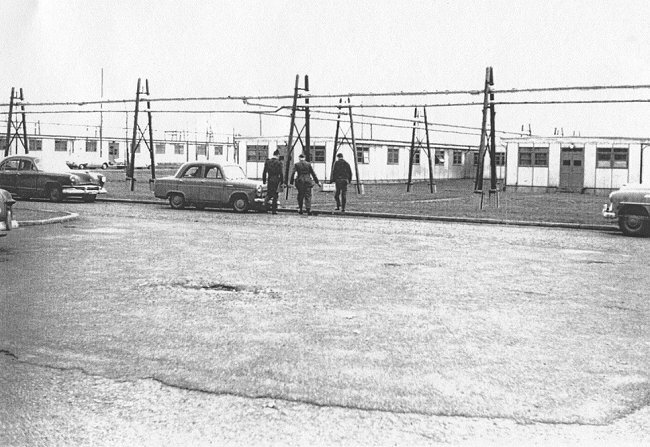 Barracks on the station - September 1960. 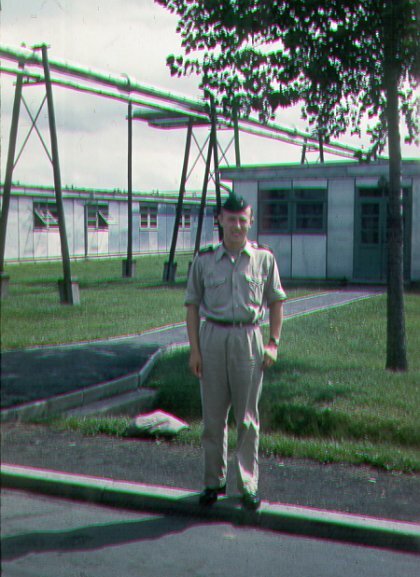 Unidentified French airman in front of barracks - June 1960. 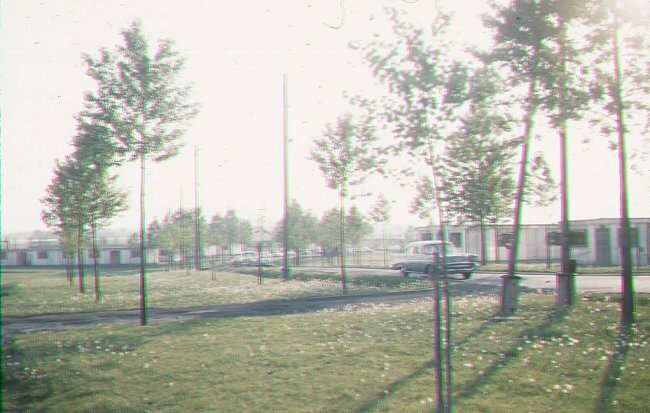 Yet another view of the barracks area - May 1960. 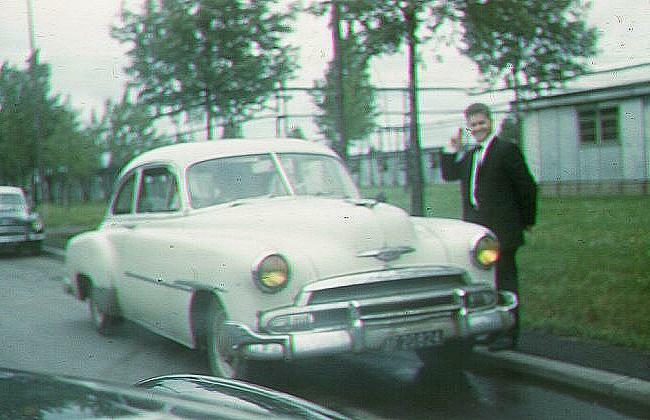 LAC Chabot (MSE Driver) with his American car in front of barracks - April 1960. 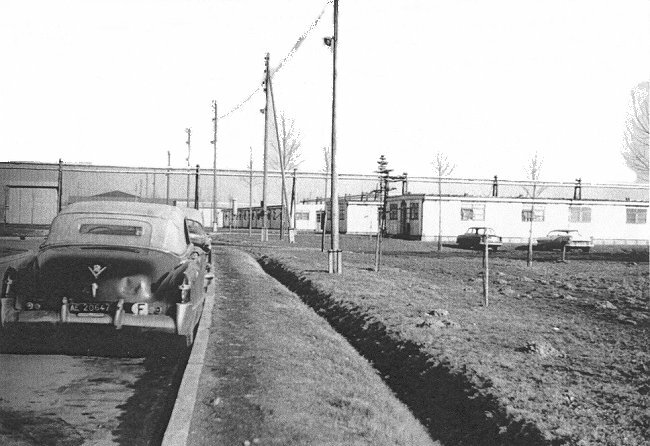 Another view of the car and the barracks - April 1960. 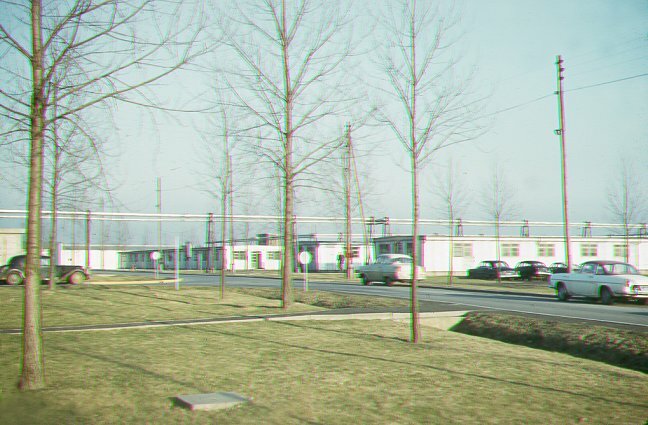 Airmen's barracks - April 1960. 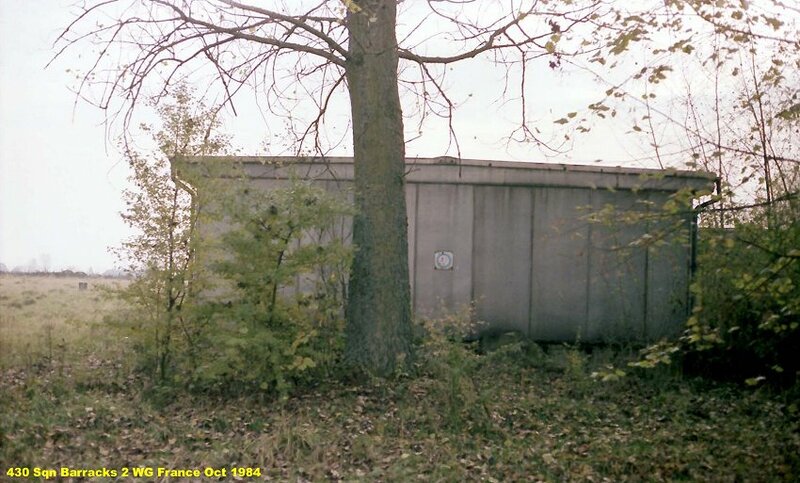 Barracks on the station. 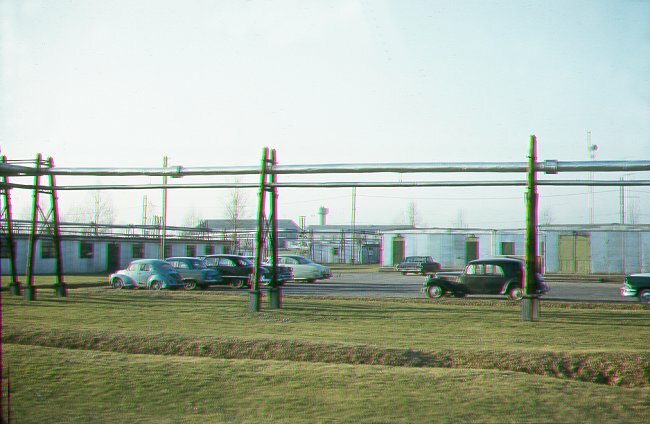 Note the many overhead heating pipes - March 1960. 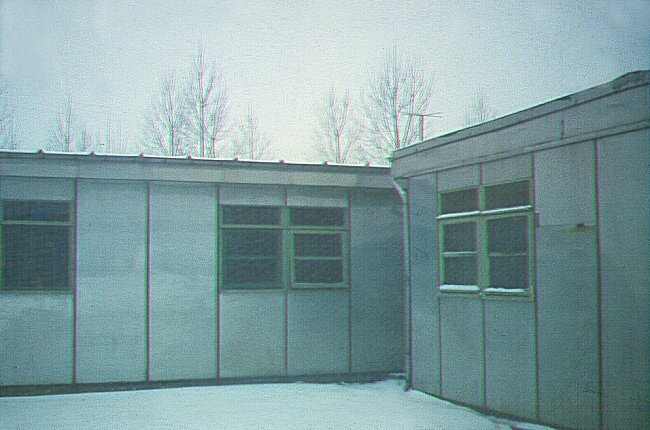 Snow accumulates by the barracks - January 1960. 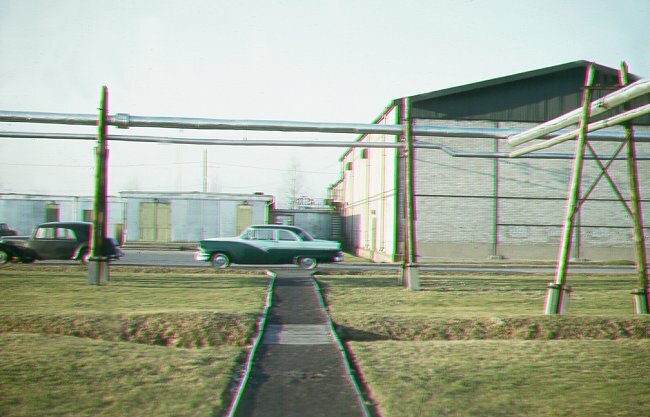 View from the front door of Barrack Block 19 - April 1958. 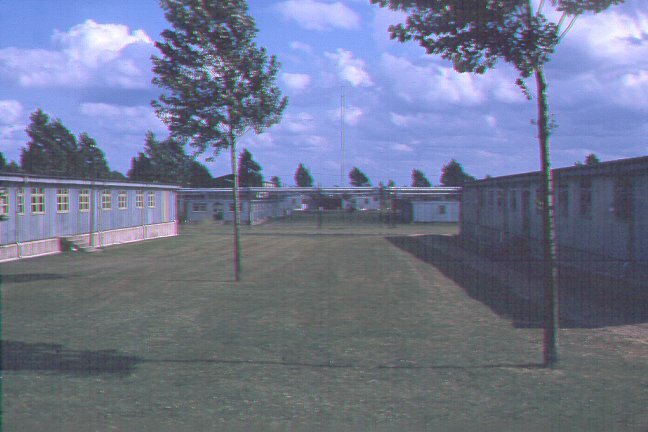 View from the front door of Barrack Block 19 - September 1957. 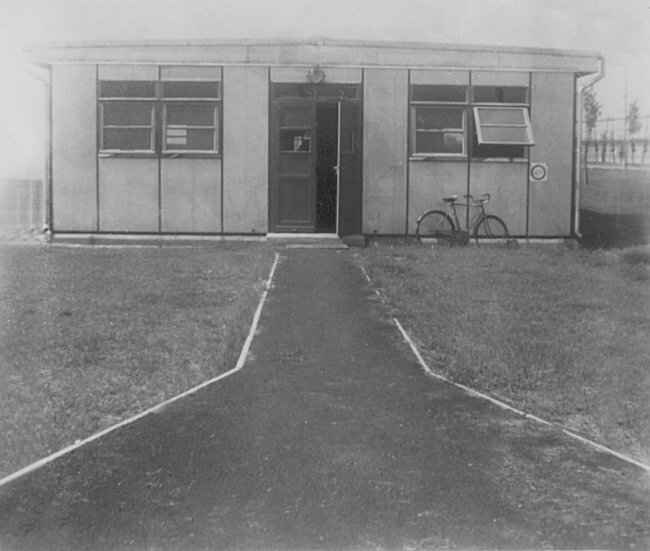 Front entrance to my barrack block - April 1955. 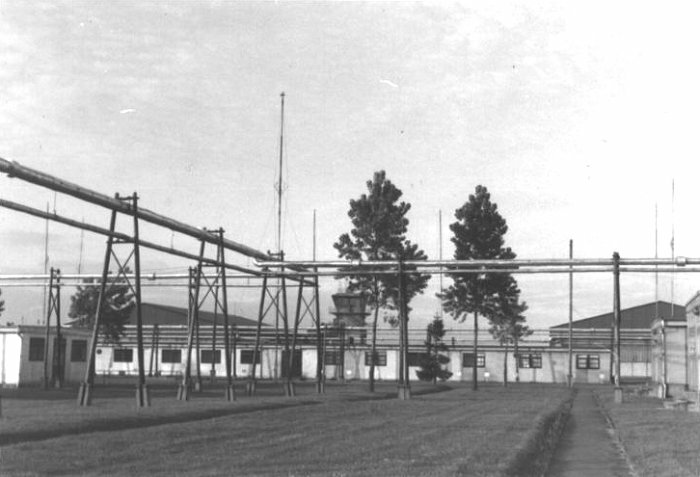 Barracks at 2 Wing Grostenquin with overhead heating pipes - September 1954. 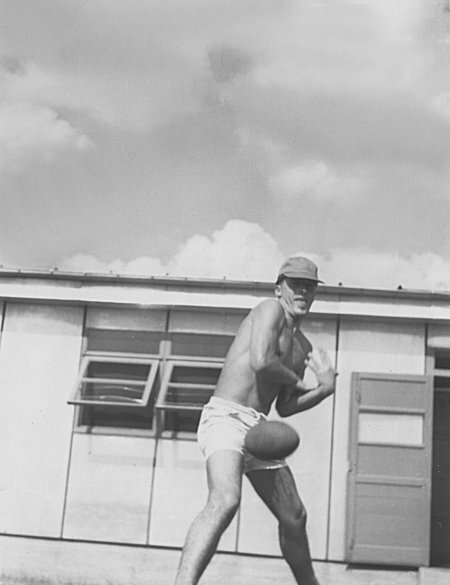 Alex Johnson trying to play football by the barracks - August 1953. 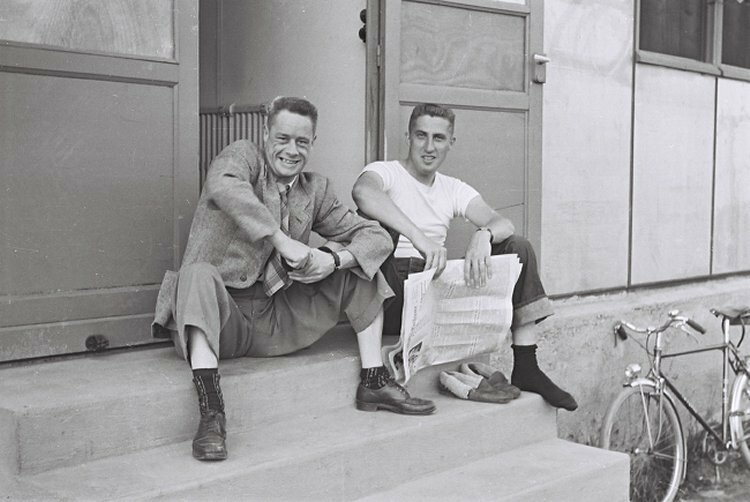 Two unidentified airmen sitting outside of baracks - July 1953. 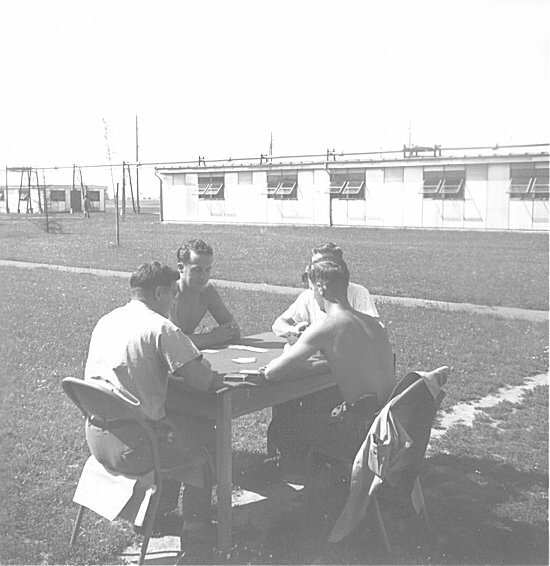 RCAF personnel playing cards on a home-made table - July 1953. 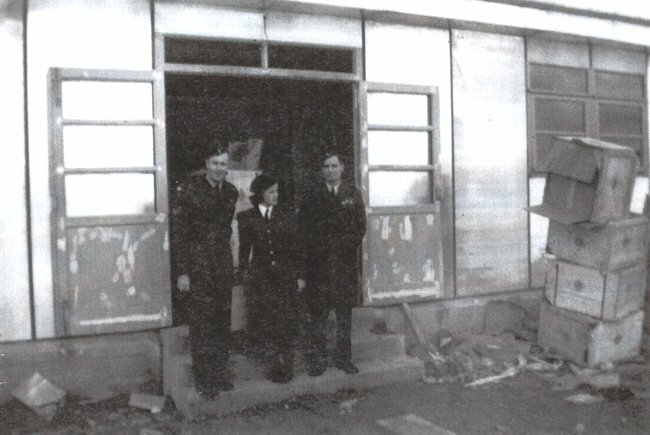 RCAF personnel by the side door of one of the barrack blocks - June 1953. 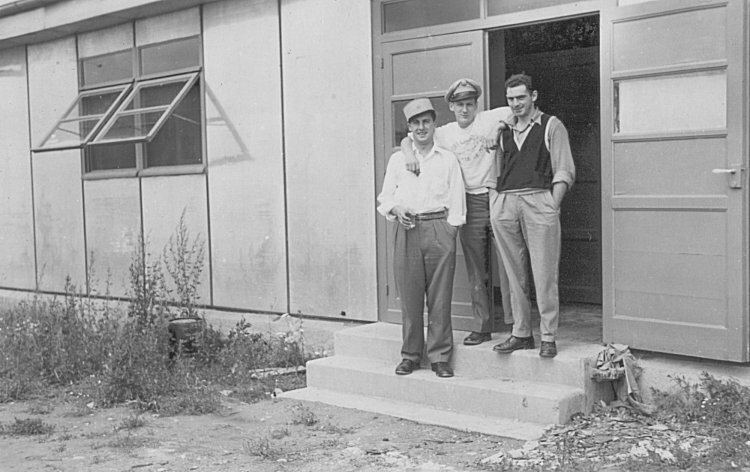 (L-R) - Alex Johnson (with the French hat), unknown, Cuthier. Weeds and grass (?) 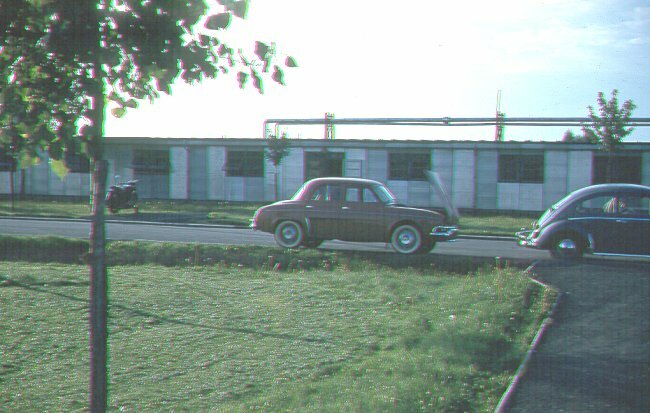 start to grow - June 1953. 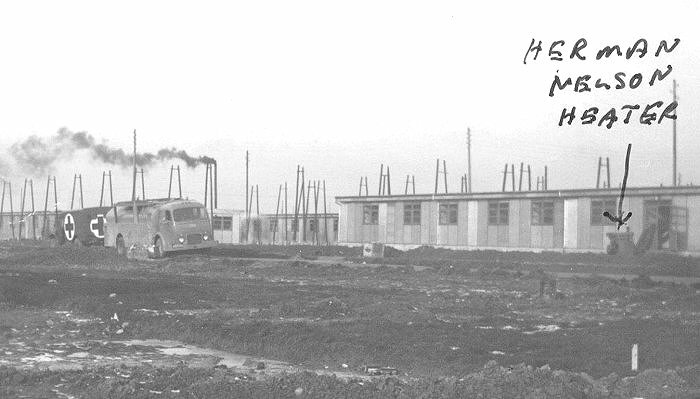 At least the mud had disappeared - June 1953. 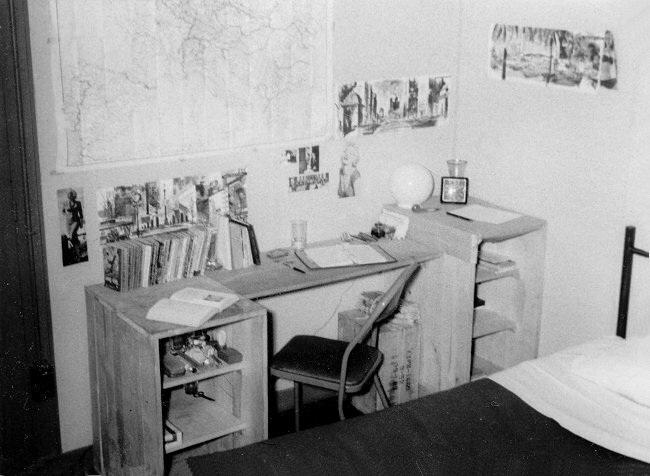 Another interior view of a barracks room - April 1953. Yet another makeshift arrangement with crates. The bed was properly made as we had started barrack inspections. 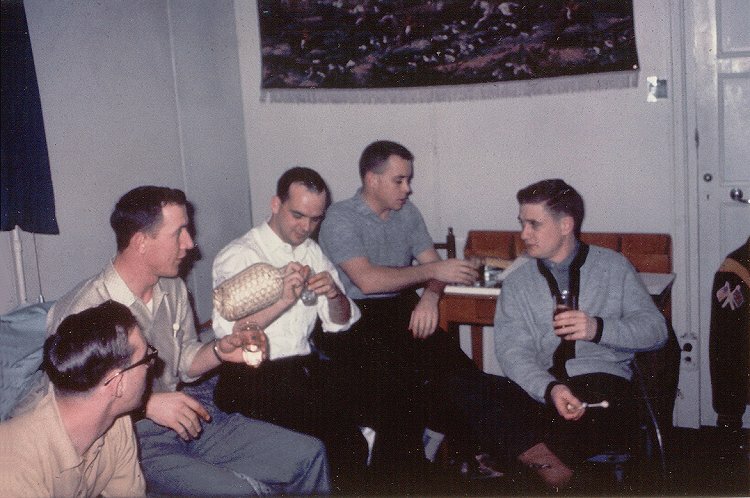 LAC Lavoie practicing the saxaphone in barracks - March 1953. Smitty fishing on the floor of his room. The roof had a bad leak - March 1953. 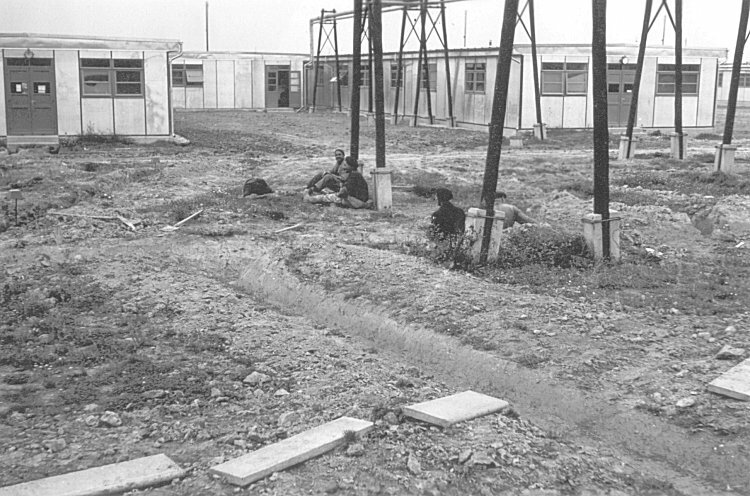 Local "Arabs" taking a rest outside of Barrack #2 - March 1953. 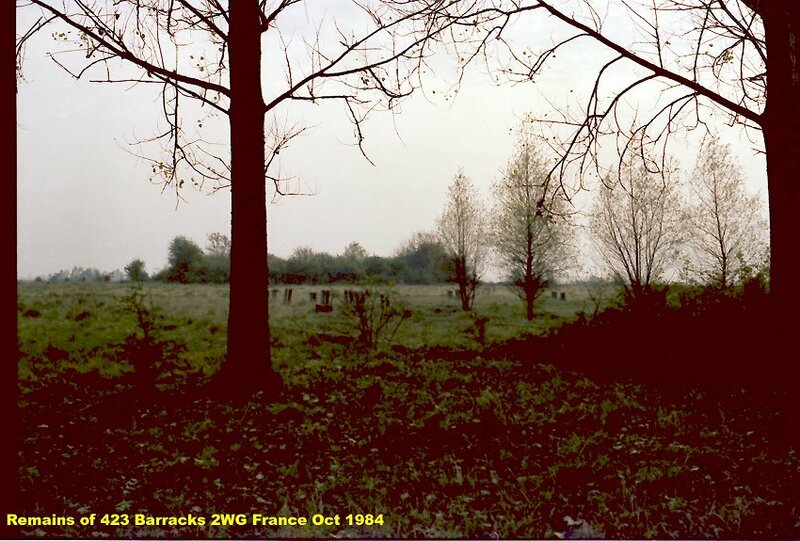 One big "mud hole" - March 1953. 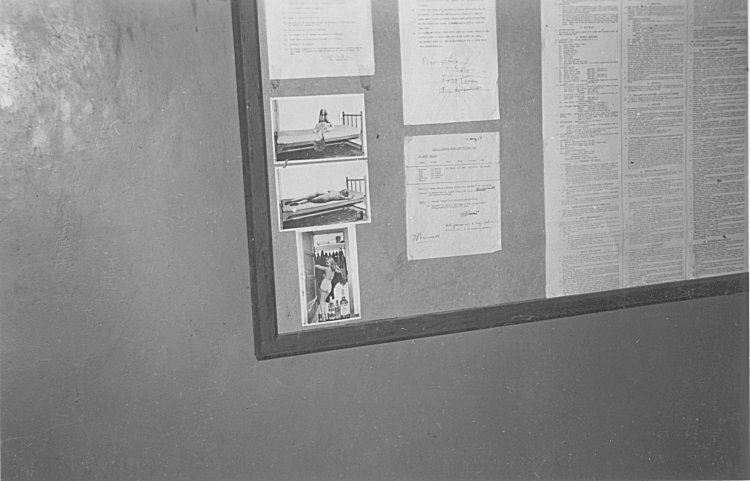 Bulletin board in one of the Airmen's barracks - February 1953. Look closely at the photos - also a "notice" not to use the water. 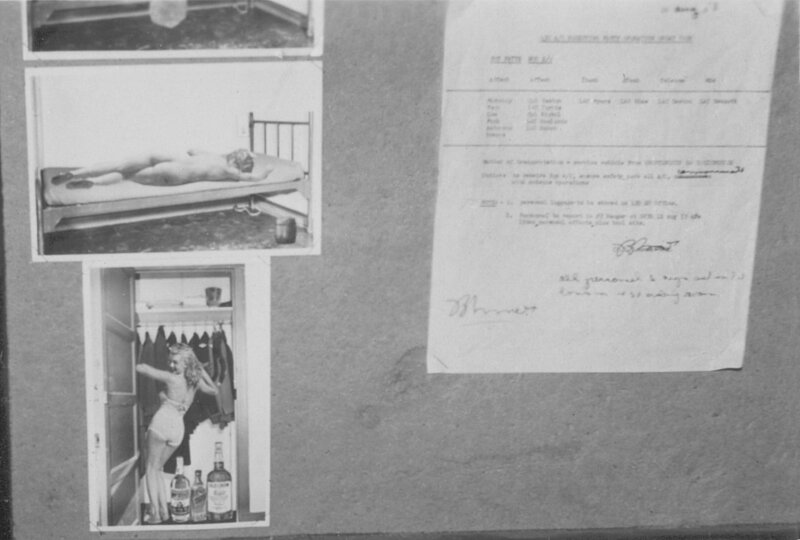 Larger image of the photos on the bulletin board - February 1953. 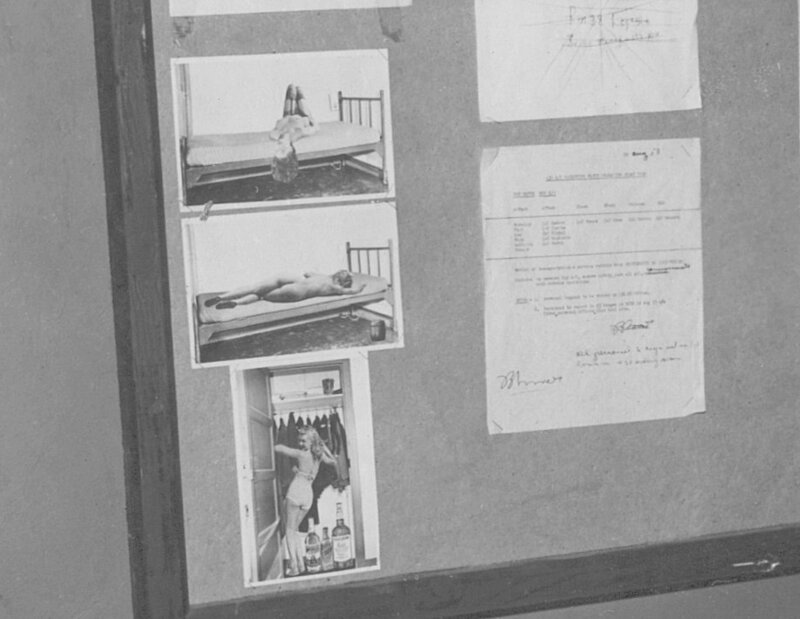 Photos on the bulletin board with a notice "not to use the water" - February 1953. 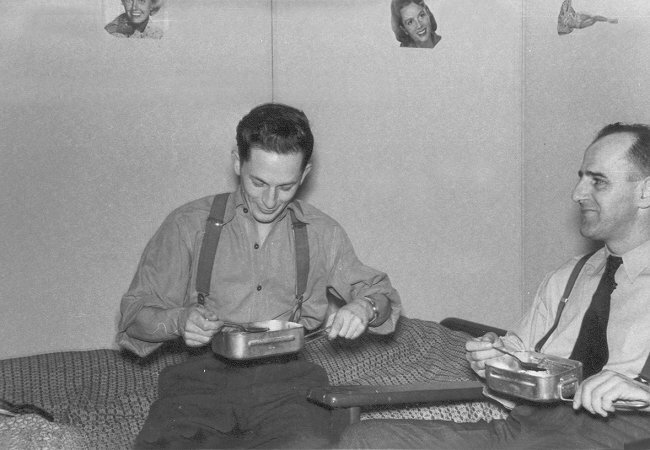 Eating in the barracks was generally better than the Mess Hall in the early days - February 1953. 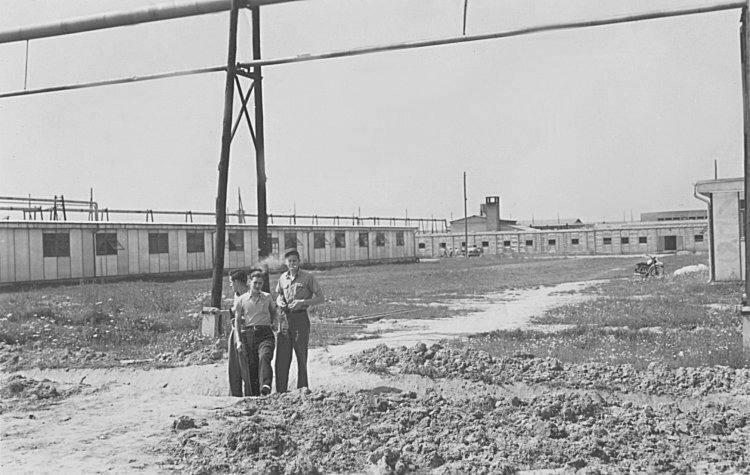 One days accumulation of "mud" in the barracks - January 1953. 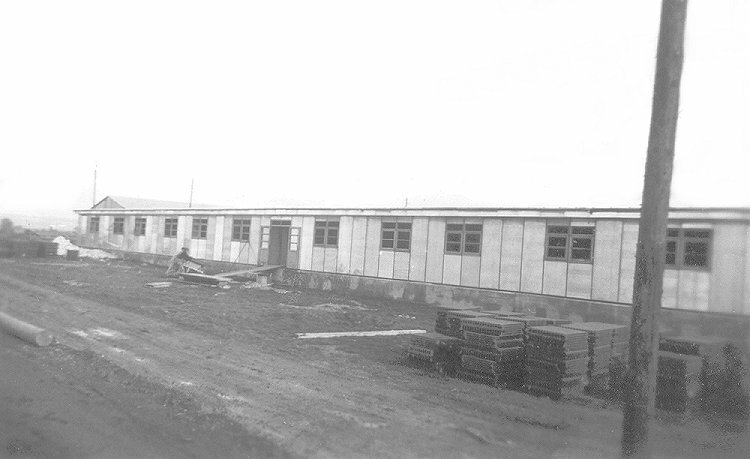 One of the many aluminium barrack blocks - January 1953. 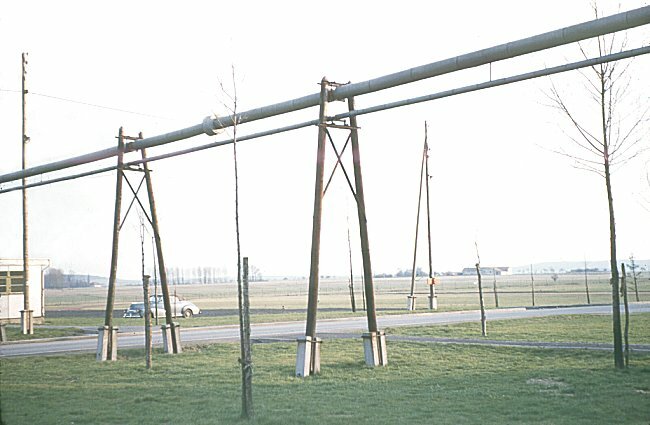 Note the "Herman Nelson" used for heat at the middle side entrance. 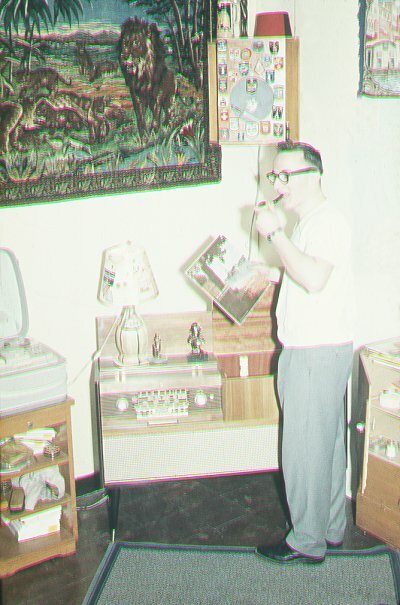 Typical scene in the barracks. Sitting (L-R) Johnny Vigneault, Red ?, LAC Tondreau. Back (in the middle) AC1 Bill Monroe - December 1952. 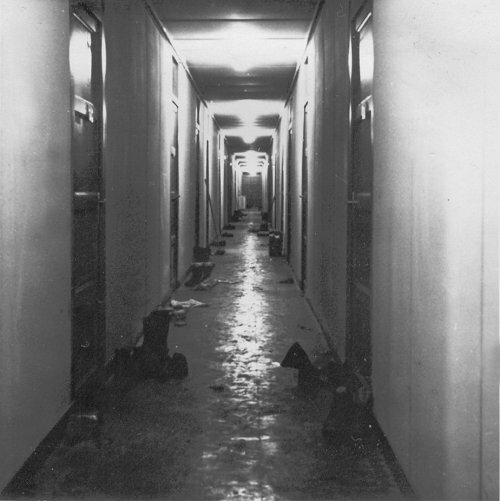 A typical scene in the barracks. Nothing but the best with a bottle of Haig & Haig Pinch #1 - the finest Scotch. Notice the makeshift shlef by the bed which was made from a couple of planks. 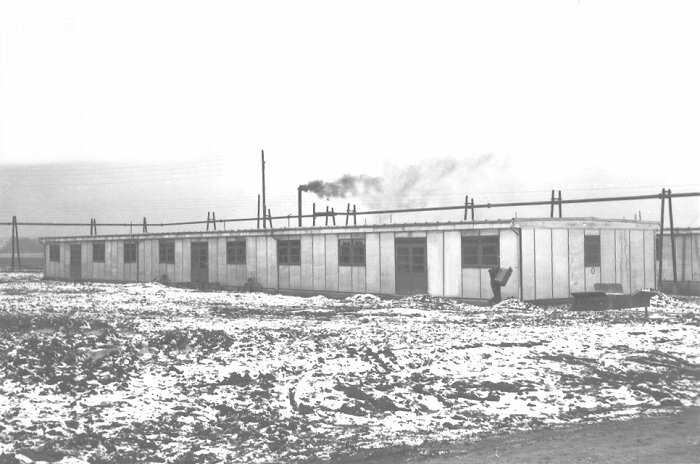 We were making use of Herman Nelson heaters to provide heat in the barracks. The gas truck got stuck in the mud and they were trying to pull it out with the 4x4 Ambulance - December 1952. 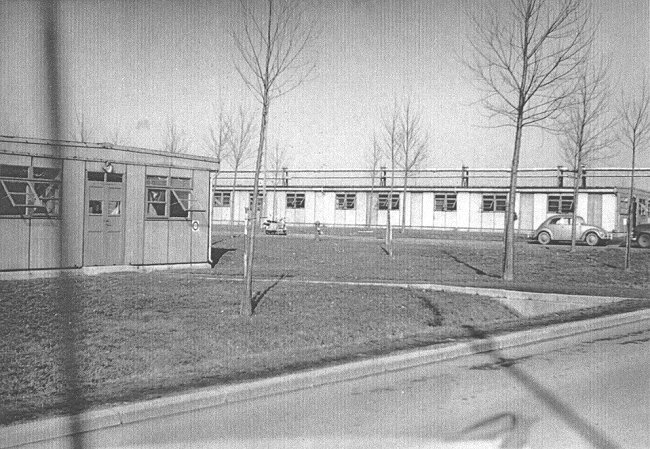 Barracks at Grostenquin - November 1952. 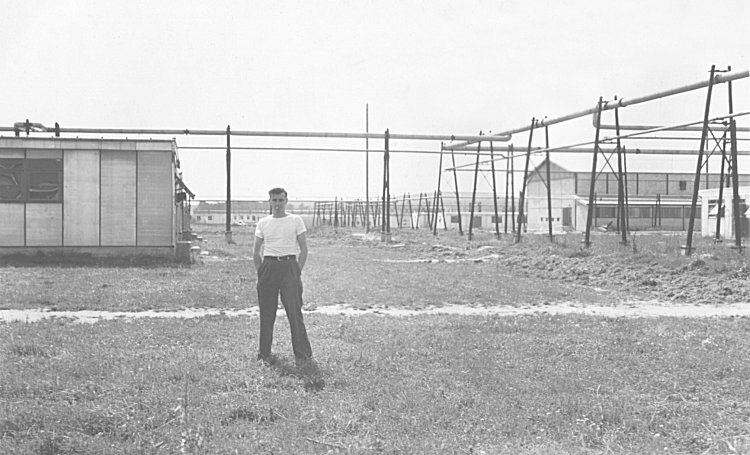 This barrack block at 2 Wing served as our "Home Sweet Home" - October 1952. 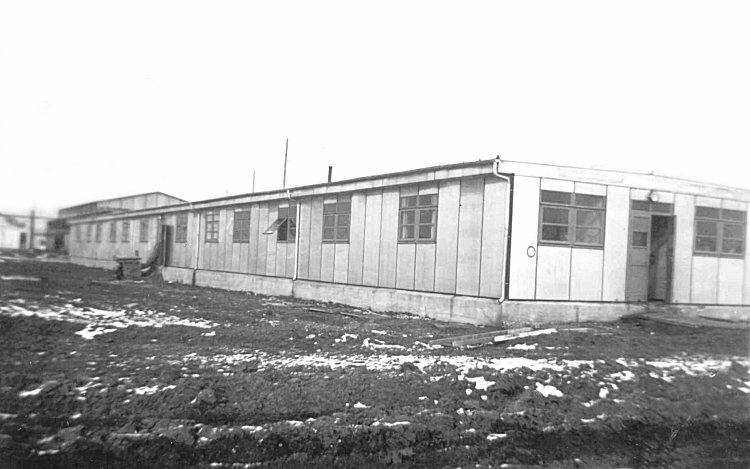 There was no hot water or electricity and the rooms werepopulated with six men in three double bunks. Oh yes - did I tell you about the "mud"?. 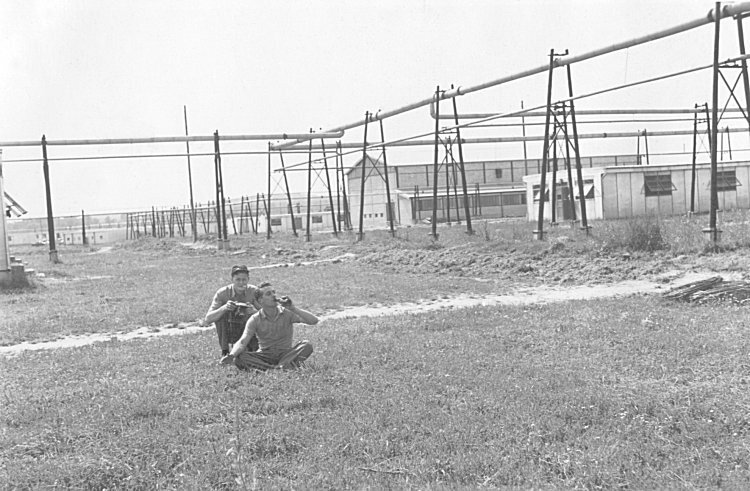 (L-R) Sgt Ron Rockey, Nursing Sister Gagne, Sgt Len Bishop check out construction progress with barracks - September 1952.